Grande Tartarie Et Isles Du Japon, Suivant les Relations les plus autentiques. This is a beautiful 1786 map of Tartary, Korea and Japan by French cartographer Louis Brion de la Tour. Centered on Chinese Tartary, the map details Korea, Manchuria, Chinese Tartary, Russian Tartary, Independent Tartary, and Japan. The map renders the entire region in extraordinary detail offering both topographical and political information. Seoul (Kinkitao) is noted along the River Li (Kiang River). Perhaps the most striking features of the map is the depiction of the Northeast Passage. The Northeast Passage, much like American's Northwest Passage, was a long sought after sea route through the Arctic that would save European merchantman the expense of rounding Africa in order to access the trade riches of East Asia. 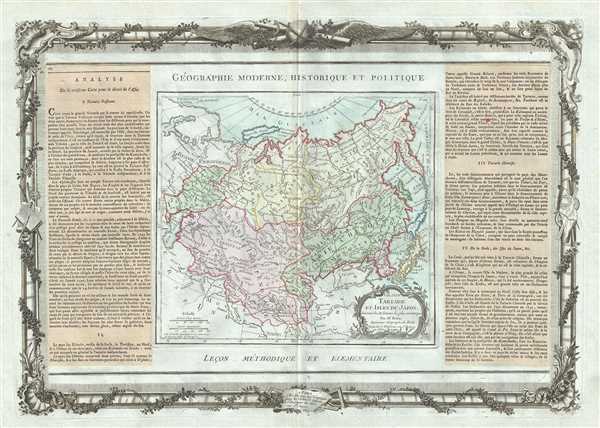 A beautifully engraved title cartouche adorns the bottom right quadrant of the map. To the left and right of the map are paste downs of French text with remarks and description of the map. Surrounding the whole is an elaborate decorative border featuring floral arrangements, surveying tools, elaborate baroque scalloping, and a winged globe. This map was issued as plate no. 44 in the most deluxe edition of Desnos’ 1786 Atlas General Methodique et Elementaire, Pour l’Etude de la Geographie et de l’Histoire Moderne.